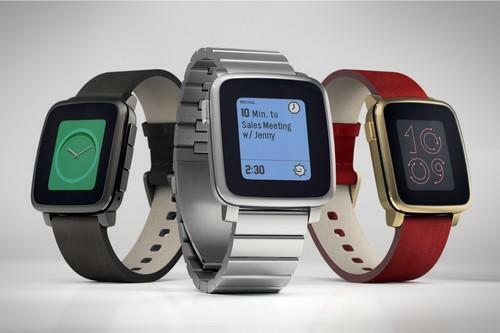 Pebble won record support from the Kickstarter crowdfunding community in its second trip to the well, for its next-generation Pebble Time smartwatch, CNN Money reports. It raised $20.3 million from 78,463 people in a campaign ended Friday, making it the most-funded Kickstarter campaign ever by a $7 million margin. When it ships in May, the device will go up against the Apple Watch but offer a week between battery charges (rather than a day) and a lower price of $199. Salesforce.com's Marc Benioff isn't the only Silicon Valley CEO to protest "religious freedom" laws that are giving cover to anti-gay discrimination in the U.S.: Apple's Tim Cook added his voice via an opinion piece in Sunday's Washington Post about legislation that's been introduced in close to half of American states. The Alabama-born chief executive cited both his Baptist upbringing and last century's civil rights movement in calling on people to have the courage to fight discrimination. The last time Intel made a really big acquisition was when it paid $7.5 billion for McAfee in 2010, but now it's apparently considering spending big to buy chipmaker Altera, which has a current market cap of $10 billion, the New York Times reports. Altera makes field-programmable gate arrays; a post from EE Journal last June speculates what Intel could do with FPGAs in the data center -- and why it might acquire Altera. Former Hewlett-Packard CEO Carly Fiorina may have her sights set on a much higher office, re/code reports. She said on Fox News Sunday that chances are "very high" she'll run for U.S. president, but she's not announcing her plans until late April or early May. An Internet gateway device popular with hotels is vulnerable to hackers, security researchers say, and allows them to launch attacks against guests accessing their Wi-Fi networks. Multiple models of InnGate equipment, manufactured by ANTlabs, could give attackers full read and write access to the device file system, according to researchers from security firm Cylance. ANTlabs has issued patches to address the problem but it's up to system operators to apply the fix. Hackers accessed "tens of thousands" of frequent flyer accounts of British Airways customers, the Guardian reported. No information was stolen or personal information accessed, BA said. But the accounts have been frozen as a precaution until the airline resolves the issue. Late on Sunday GitHub was recovering from a massive DDoS (distributed denial of service) attack that started on Thursday, and was the largest such attack in its history. The attack was aimed at anti-censorship GreatFire and CN-NYTimes projects. The malicious traffic, coming from China, affected all of GitHub. Facebook wants to beam Internet access from drones and let you connect with your friends through virtual reality. Kleiner Perkins successfully defended itself in a gender discrimination lawsuit, but will dirty laundry that was aired lead to changes in the corporate culture of Silicon Valley? The New York Times looks for lessons learned.